The anger and aghast palpable in many of CORD Leader Raila Odinga supporters after yesterday’s incident in Kwale can only continue after Kenya Today interviewed sources close to the former Prime Minister’s security team. Sometime in August 2013, the government attempted to make far-reaching security changes to the cohort of police officers assigned to protect the former prime minister. Most of the 12 policemen brought on board were people unknown to Mr. Odinga who respectfully asked them to return to their bases. At issue was a government proposal to change Raila’s long time police aideÂ Sergeant Francis Odhiambo Ogola with a Mr. Job Boronjo who had been assigned to take over the security of Mr. Odinga. The same changes were to happened to one of Raila’s long time police driver, a man of of Luhya descent. Mr Boronjo, an unknown policeman believed to be a NIS spy agent twice texted the team headed by Mr. Odhiambo to return to their bases for redeployment. When the man persisted he wanted to protect Odinga, even without his willingness, Odinga called former aide Eliud Owalo and asked him to meet IG Kimaiyo over the tussle after which the old security team of the former PM remained by his side. For someone like Sergeant Odhiambo Ogola, Mr. Odinga has been his boss since 2001. The same can be said of several police officers assigned to Odinga. The standard procedure in assigning security officers is that the person to be protected is the sole determiner, in the end, on who should protect him. Protection isn’t just a security issue, it touches on one’s personal and family privacy, and, in politics, with constant shift in authority, power and allegiance, the policeman with a gun next to you is the first security scare; you cannot gamble with who stays around you, your home and your children. Ordinarily, an order seconding or withdrawing security officers should be sent as a signal from the IG to the GSU Commandant which is then presented to the VIP concerned as evidence of the new instructions. The signal is supposed to explain the changes and how they were arrived at. The signal can only be rescindedÂ via another signal. In Odinga case, Mr. Boronjo showed up with his team, texted Mr. Odhiambo through an SMS to report back to the GSU immediately with his team. 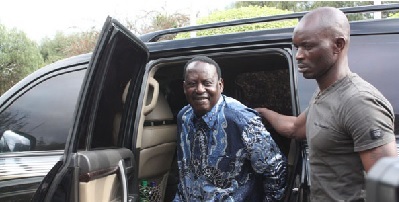 The saga played out at Odinga’s office as drama, which made the former PM ask ‘why’? To him, the whole thing was ”ruinous and suspect”. Even more egregious, all the police officers were required to return back to their bases at one go. It was later revealed Boronko was acting at the behest of GSU commandant William Saiya. Of course, Odinga rejected these shenanigans. I bring ”standard procedure” to reveal an incident which Odinga never wanted, and, which has led to most of security lapses around him. Once Odinga had rejected the police officers assigned to him, and chose to stick with his decade old officers, many of whom he had personally empowered and paid their bills for years when government frustrations set in, the Jubilee government took to newer tactics of frustration. For instance, while in August the government claimed he had assigned 12 police officers to Mr. Odinga, the officers were assigned two vehicles. Despite the discomfort, many are the times the vehicles stayed parked, without fuel, to hinder the movement of the officers with Mr. Odinga. Most of these officers are senior police officers. While Mr. Odinga has avoided making comparisons between his security and those of other VIPs in the country (whose security are more enhanced), the ugly incidents as those which happened in Kwale only make us to return to the question of Odinga security, which, really, is a national security issue. Sources within Odinga security team also reveal that most of the said officers had their salaries stopped altogether; and Mr. Odinga has continued to provide for them, their families – many with school going children – despite them being assigned and seconded by the police force. After yesterday, the belief around Odinga security team is that the government wants to know what Odinga is up to. With his decade long police team, strategy leaks has been well coordinated that they don’t exist – the policemen around Raila are seen to be uncooperative when it comes to revealing what their boss is doing, whom he is meeting, when, where and, potentially, why. To spy on Odinga, goes the thinking in government, he must be assigned new officers. At issue now is the report – which government did not have – that Odinga is scheduled to lecture at the prestigious Yale University. This comes only a week after he led three governors to Germany with Mombasa’s Ali Hassan Joho again flying to Washington DC to meet the powerful black congressional caucus, an important African-American community in American politics which has been elusive to President Uhuru Kenyatta and the Jubilee government. Uhuru’s inner circle believes the power Raila wields in the international community still outweighs their man, and, if unchecked, will return to haunt them as the country gears to 2017. In the US, it is instructive to note that Uhuru is yet to meet, on bilateral level, any meaningful US political players. To know, henceforth, whether the incident was intentional or not, a lot will depend on how the government handles the police team around Raila. My take is that this will be another opportunity to attempt to change Odinga’s security detail, stuff it with NIS characters and sit pretty, waiting to get every political move the former PM makes. Security to the former PM and opposition leader is non-negotiable; but it should come in a manner that allows him to remain a politician, more so, the leader of the opposition coalition CORD.